Celebrating 10 years of Google Israel and the 20th anniversary of the Israel National Trail, Google and The Society for the Protection of Nature in Israel have initiated ajoint project to photograph the Israel National Trail. 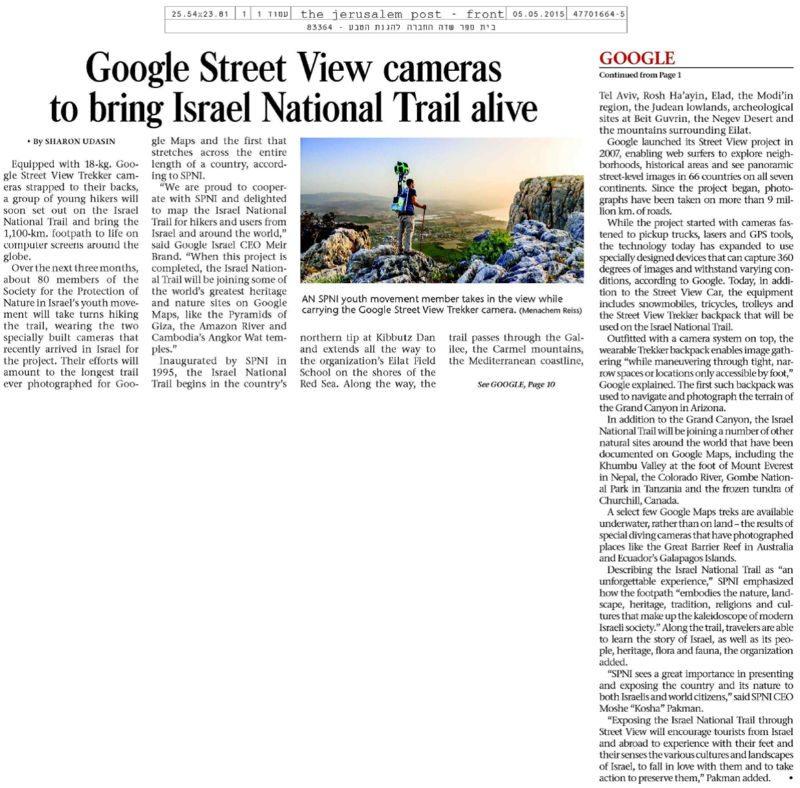 Members of SPNI’s National Service Volunteer program will hike the full length of the 1,100 km Israel National Trail carrying Google Street View cameras in order to create the longest photograph of a hiking trail ever. It will be the first photograph in the world of a hiking trail that stretches the length of an entire country. 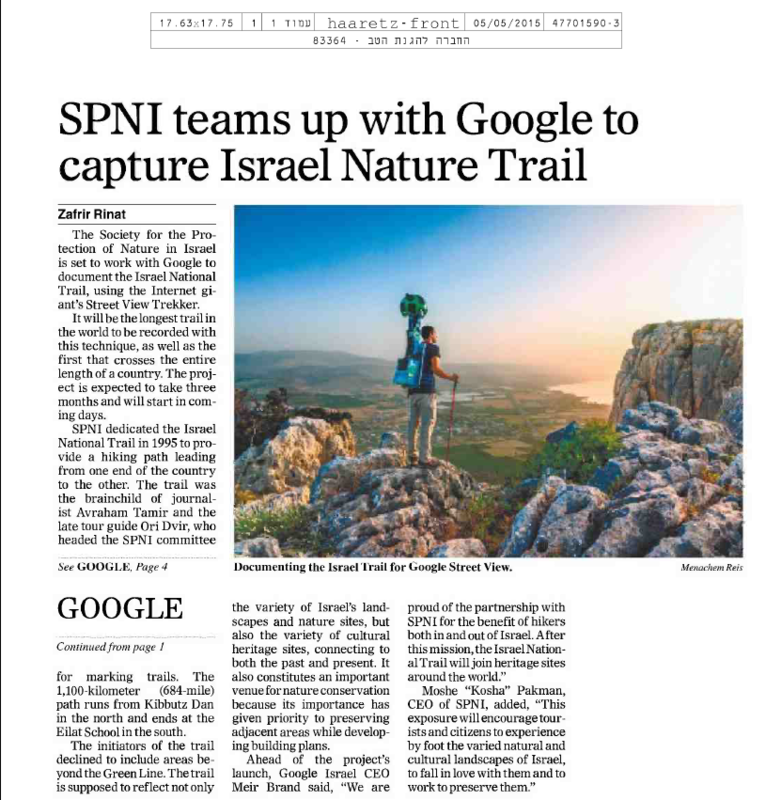 Over the next three months, SPNI’s Youth Volunteers will hike the 1,100 km Israel National Trail carrying on their backs Google Street View Trekker cameras to map the trail for hikers. Two specially built portable cameras have recently arrived in Israel to create the longest photograph of the a trail ever and the first photograph in the world of a hiking track that stretches across the length of an entire country. The Israel National Trail was inaugurated by SPNI in 1995, creating a hiking track across the entire country. The trail begins in Kibbutz Dan in northern Israel and ends at SPNI’s Eilat Field School on the Red Sea. It passes through the Galil, Carmel, along the Mediterranean coastline, Tel Aviv, Rosh Ha’ayin, El’ad, the Modi’in area, the Judean lowlands, archeological sites at Bet Guvrin, the Negev wildernesses and the Eilat Mountains. The Israel National Trail embodies the nature, landscape, heritage, tradition, religions and cultures that make up the kaleidoscope of modern Israeli society, making the trail an unforgettable experience. Telling the story of this country, of its people and heritage, the trail includes various landscapes, flora and fauna. The entire melting pot of Israeli society can be seen on the trail – young children, youth groups, soldiers, tourists, immigrants, families and senior citizens. The Israel National Trail is a registered trademark of SPNI. Google’s Street View project was launched in May 2007 and is currently available in 66 countries on all 7 continents. The feature enables users to virtually navigate neighborhoods, historical sites, museums and public buildings through panoramic pictures taken at street level. Since this project began, photographs have been taken of over 9 million km of roads. The project began with pick-up trucks loaded with cameras, laser devices and GPS that travelled throughout the world and has since expanded to include a large number of specially designed devices that can capture 360 degree views in different conditions. Besides the designated Street View Car ,the Street View team has used snowmobiles, tricycles, buggies and backpacks. More about the photography and technology devices behind Google Street View can be found here. 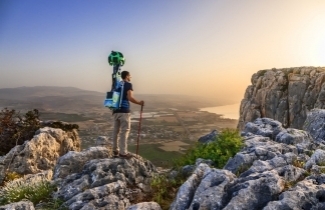 Google Street View makes it possible to find some of the most beautiful landscapes and hiking routes in the world. The Israel National Trail is joining a long list of hikes and landscapes that are documented in Google Maps. Among the different sites that can be viewed are Khumbu Valley at the foot of Mount Everest in Nepal, the Colorado River, the biggest corals in Australia’s Great Barrier Reef and the Ancient Pyramids at Giza. More about the different trails that have been photographed can be found here. SPNI CEO, Moshe ‘Kosha’ Pakman, “SPNI sees a great importance in presenting and exposing the country and its nature to both Israelis and world citizens. Exposing the Israel National Trail through Street View will encourage tourists from Israel and abroad to experience with their feet and their senses the various cultures and landscapes of Israel, to fall in love with them and to take action to preserve them."